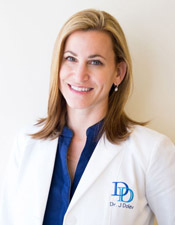 Jacqueline Dolev, M.D: 2001, M.D. with Honors, Yale School of Medicine; 2003, Internal Medicine Residency, Stanford University; 2008, Residency and Fellowship in Dermatology, University California, San Francisco; board certified dermatologist. She is a national speaker and has published extensively in peer-reviewed journals. She is an Assistant Clinical Professor, University of California San Francisco; attending physician, California Pacific Medical Center, and in private practice specializing in cosmetic and medical dermatology.